One environmental problem that is receiving wider attention recently is the pollution of our environment, especially our oceans, lakes and other water bodies, with plastic objects. The most commonly found objects include coffee cups, water bottles, disposable (one-time-use) grocery bags, and packaging. 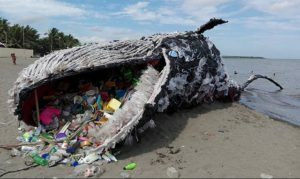 Plastics are particularly problematic for the environment because they are based on petroleum (more use of fossil fuels), are inexpensive and do not biodegrade or breakdown entirely, and so they last for a long time in the environment. A foam plastic cup can take 50 years, and a plastic beverage holder 400 years to degrade. As a result many organisms and animals digest the plastic particles remaining in water bodies. 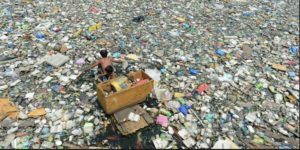 And massive garbage patches of plastic waste are formed in discrete areas of the ocean, some containing hundreds of millions tons of waste. As is clear from the list of common plastic waste, consumers are responsible for many of these items and so changing consumer behavior, never an easy task, is part of the solution required. Other solutions include reduction of use of plastic materials and objects, a plastic bag levy, and re-usable coffee cups. Identify the closest water body where plastic wastes are visible in the water or on the shore. Determine how these plastic wastes are getting into the water. Check to see if there is an environmental organization that surveys or monitors plastic waste in water bodies in your area, and see what they have found about the volume of plastic waste and its local sources. Determine what you can do to reduce your use of plastic materials and objects that you dispose of, and reduce your waste by 10% each year for 5 years.